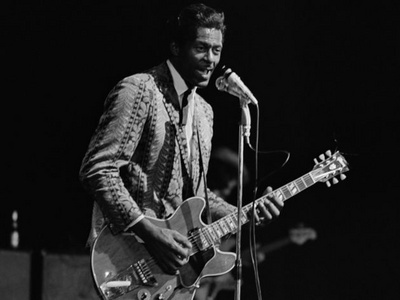 May 21st 1955; John Lennon once famously said that “if you tried to give rock and roll another name, you might call it ‘Chuck Berry. '” That’s how foundational Berry’s contributions were to the music that changed America and the world beginning in the mid-1950s. Berry was a part-time professional musician in his native St. Louis and primarily a performer of the blues, but an avid experimenter with other sounds. On a visit to Chicago in May 1955, Berry approached his idol, the great bluesman Muddy Waters, to ask for career advice. Waters pointed him in the direction of his record label, Chess Records, where Berry managed a face-to-face meeting with Leonard Chess and an invitation to return for an audition later that week. When Berry returned, he hoped that Chess would sign him on the strength of one of his blues numbers, but it was a strange rhythm-and-blues/country-western hybrid called “Ida Red” that caught Chess’s ear. Before it was recorded, “Ida Red’ got new lyrics to go with a new title—”Maybellene”—but it retained the totally original sound that Berry had given it. Berry returned to St. Louis unsure of what would come of his Chicago recording session. In the meantime, Leonard Chess made a business deal that was commonplace at the time, trading co-songwriting credit and a third of royalties to the prominent DJ Alan Freed in exchange for his help in promoting “Maybellene.” While audiences legitimately went wild over the backbeat-meets-hillbilly sound of “Maybellene,” it surely did not hurt the record’s chances of success to have Freed play the single for two hours straight during his WINS radio show in the early summer of 1955. Chuck Berry had returned to his part-time job in construction and begun training to be a hairdresser when “Maybellene” hit the airwaves. After “Maybellene” became a #1 R&B hit and a #5 pop hit—the first hit rock-and-roll single by a black performer—Berry set down his hammer and scissors in favor of his Gibson ES-350T and major place in American cultural history.